While everyone else in the world (yes, every single person in the world who isn't me) digs into Pokémon X and Y this weekend, I'll be impatiently waiting for my copy of this portable, catch-them-all-centric RPG to show up on my doorstep. That's not because I decided to order my copy from a retailer with snail-slow shipping, by the way; instead, it's because, as is stated in the header above, I recently bought one of the gold Pokémon Center 3DS LLs that were just released in Japan and that come packed with a digital version of either Pokémon X or Y. Is this one of the crazier things I've done in my gaming life? I think it may be. I guess that speaks to the power of this system's stunning, Disney-esque (in my opinion) design. Speaking of designs, I can't say I'm thrilled with the boxes (see above and below) that contain these systems and their related accoutrements. I expected the packaging to be shimmery and gold, like the systems themselves. Oh, well, I guess the red and blue backdrops help draw attention to the golden systems hidden within. Although I have no idea when my gold 3DS LL will arrive, you can rest assured that as soon as it does I'll snap tons of photos of the packaging and the system and everything else and then share them here. In the meantime, let me know in the comments section below what you think of Pokémon X and/or Y, should you be able to pull yourselves away from its preciousness. Thanks for the support, Erik! I agree that it's beautiful, but still... I kind of can't believe I went through with it. Ha ha! OK, I can go with that, too, Ryan. Really, I'm just hoping I'm not too scared to play the damn thing. Of course, it's now my only Japanese 3DS, so I guess I'm going to have to play it! I used to have a bunch of these. Like, limited edition systems I mean. Like I had all these Japanese boxed Pokemon GameBoys and stuff. Anyway. One of the reasons why I think it was convenient for me to stop was, systems these days have gotten real.. Exclusive. If I had a bunch of limited edition Gameboys I could play anything I wanted on them whereas, DS's and stuff, have accounts tied to the individual systems. I think. Right? Like there's little leighway for user purchases available on various editions of a 3DS that any user may have. Maybe..
Good point. If you were to get a second handheld nowadays, you'd have to specify one of them your "downloaded content" system or things would get confusing/inconvenient pretty quick. Jealous! I'm still waiting until I have the money to get the actual game, haha. If only 3DS games/systems were region free, I'd go for a limited edition 3DS LL some day. Oh, yes, I agree, Francis. And believe me, this isn't something I'm planning to make into a habit. I bought this one because I fell in love with it for all sorts of reasons. Also, I was in the market for a Japanese 3DS LL (I had an JP OG 3DS, but I've found that I much prefer the LL's/XL's larger screens), so why not go whole hog and get the one I want the most? I see what you're saying, Jeremy, although in my case it hasn't been all that confusing. Basically, I buy everything possible using my North American 3DSes. If there are physical or digital 3DS games that I really want but that don't get announced for NA release after a certain period of time, I buy or download them for my JP 3DS. I actually find the Vita situation more confusing in this regard, but that's likely because I haven't taken the time to really figure out what I'd be able to do if I, say, bought a Japanese Vita or Vita TV. Yeah, like I said earlier, it definitely blows that Nintendo decided to region lock the 3DS. 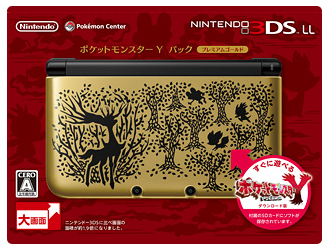 And even worse, they're leaving all kinds of cool 3DS colors and LEs/SEs as Japan-only items--such as this system and the Charizard and Eevee LLs. Why they're doing this, I have no idea. Surely Euro and North American gamers would snap up these systems in a heartbeat, too? Sigh. Owning a Japanese Vita wouldn't do much for you. The system itself is technically region-free... it's the user account that's not. You can actually play any game with any account (even PSO2!) but if you want to use the PSN store, that's where your account's region comes in. You can only tie one account to the Vita -- and thus only access one store -- and the only way to switch accounts is to format the whole darn system. But the Japanese PSN store is a big pain anyway; you can't use a non-Japanese credit card, for example. Whereas buying stuff on the Japanese 3DS eShop is eeeeeeasy. Isn't it, Zigfried? The funny thing is, I wasn't all that impressed with it when I first saw it. Second time around, though, I thought, Hmmmm, I really like that! In fact, I WANT IT! Heh. Thanks for educating me about the Vita, BTW. I wonder why Sony made it ... annoying to switch regions RE: PSN. Oh, well, I mostly want to be able to play retail/physical JP Vita games anyway, so it sounds like I should be OK should I ever buy a NA Vita? Oh. My. God. I can't even begin to tell you how jealous I am!! BRYAN!!! What a gorgeous system, and I'm sure you'll have a wonderful time with it. Since all versions of Pokémon come with all language options, will you be playing it in English? And which did you end up going for, X or Y? I'd love to own one of these but I tend to be more selective with what luxuries I buy in the second half of the year to make sure I have for enough holidays but if I didn't have that rule for my self I probably would of done the same thing as you. As for the game it self (I downloaded Y when it 1st became available) I'm really really enjoying it so far but I'm only 2 gym badges in so I don't know much about Pokemon-Amie, super training, or mega evolutions yet so I can't really tell you how those change the experience. I wasn't so sure if I'd enjoy this one actually because White 2 never really clicked with me but I think that was because I was worrying that it would hurt my enjoyment of Y but it went the other way around. Also I don't know if I'm just imaging things but it seems less grindy and I feel like I can actually train more than 6 during pokemon during the gyms-elite 4-champion part pf the game. If you had the money to download every game you wanted *on each system* though.. Which is lol, excessive. But I guess you wouldn't wanna' totally complete a game on every single one of yr systems or anything. Yeah, you'll have no problem playing imports on a NA Vita. You just won't be able to use any DLC codes or whatnot, since those would require a Japanese PSN account. I'm not sure I'm following, Francis. Regardless, you're certainly right about me not wanting to download multiple copies of a single game and attempt to complete them on each system! That's OK. I'm sure that'll muck up a few games, but not too many. And, really, at the moment I only want a small handful of JP Vita games. Ha ha! I was wondering if you'd notice this, Anne. I was pretty sure that if you did, though, your reaction would be great--and it was! As for whether I'll be playing in English or Japanese: I hate to admit this, but my Japanese studies have stalled a bit. I'm going to get back to it shortly, but in the meantime, yes, I'm going to be playing in English. I believe you still can buy them at places like Play-Asia, by the way. Which doesn't surprise me too much, really, as how many of us weirdos actually are willing to spend that much dough for a game system? I'm sorry to hear you're still without your copy of the game, by the way. Oh, and which one will you be getting? Ah, that's too bad, Sam. Really, what matters in this situation is that you have a 3DS and a copy of this game. That's all anyone really needs (if they care about the 3DS and Pokemon, of course). One thing I feel I should warn you is that you only get to chose the langue you play in at the beginning of the game. If you want to change it you'll have to delete your save file to change it. Also (warning might be kinda of spoliery) it appears the rumor of dual type move is true as one of my Pokemon has a move called Flying Press which has the fighting symbol on it but the move's description claims it's also a flying type move. Interesting! I'll certainly be playing through X in English, no question, and I can't see why I'd ever want to change it, so no worries about not being able to do that without deleting the save file. Still, thanks for the heads up!